We’ve been talking about American trade, and last week we discussed the international aspects. One important and defining moment in American and World History is directly linked to the U.S. Navy and maritime trade interests. It wasn’t a war or even a battle. Instead, an American fleet broke through the isolationist “walls” surrounding Japan, opening opportunity for the Asian country and establishing firm diplomatic relationships between the countries. Taking place in 1853 and 1854, it signaled a positive beginning of maritime trade with Japan – an arrangement which could benefit both countries. Understanding this event is a key foundation to examining the history of American roles, influences, and diplomacy with Asia. Today, we present some overview history of the American commodore, the Japanese shogun, the first American ships to enter Japanese harbors, and the first treaty between the countries. 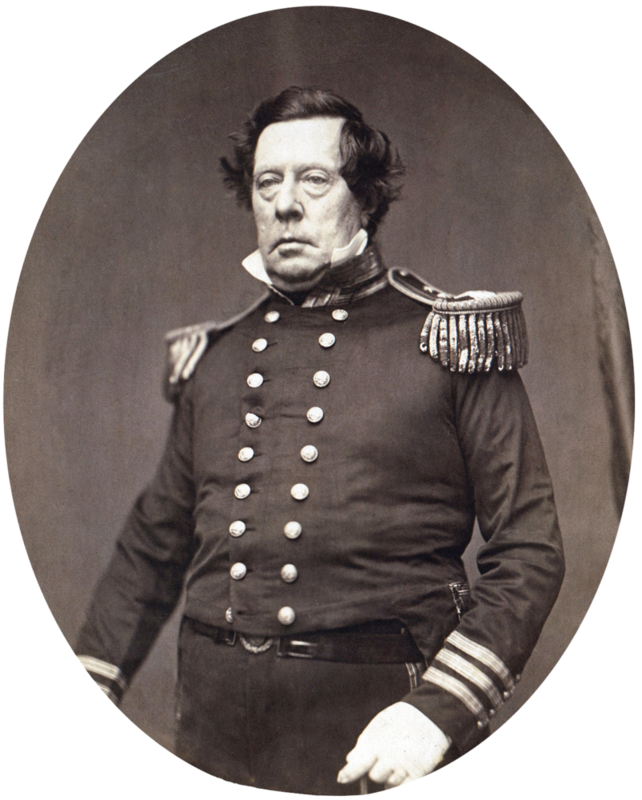 Born on April 10, 1795, Matthew C. Perry grew up in Newport, Rhode Island, and enlisted as a U.S. midshipman at age 15. He served under his older brother Oliver Hazard Perry (hero at the Battle of Lake Erie) for a short time. Throughout his naval career, Matthew Perry assisted with numerous diplomatic ventures, including founding a colony for freedmen in Africa and battling the slave trade, transporting envoys to Russia, and serving as a squadron commander during the Mexican-American War. From 1852 to 1854, Perry commanded the East India Squadron and opened Japan for diplomacy and trade (keep reading for the details!). During his navy career, Perry was credited with helping the U.S. Navy transition to steam-powered vessels and developed programs to train future officers. The commodore died in December 1857 at home in the mainland United States. Japan was closed to foreign influence. Western trade and whaling ships were not allowed to anchor in the ports. A single Dutch ship docked once a year at an island in the harbor of Nagasaki. During this time period, an emperor ruled Japan, but the Shoguns of the Togukawa family clan held the power. The country upheld standards of social castes and a semi-traditional honor system. Foreigners and “outsider influence” ranked extremely low in national opinion. For approximately 220 years, Japan had kept its doors closed to foreigners. The governors and shogun had heard that an American fleet might be coming. Debates and varying opinions reached no definitive answer for how to respond if the U.S. fleet arrived off the Japanese shore or tried to enter a harbor. The Samurai warrior class had enjoyed about two centuries of peace; the country was hardly ready for a fight. On July 8, 1853, Commodore Perry’s fleet sailed into Tokyo Bay. The large steam ships belched dark smoke, and the local people called the vessels “black ships.” Perry fired gun salutes – claiming to enjoy a belated 4th of July celebration; while the salutes intimidated the locals and spread rumors to the rulers, Perry did not intend to make war. Having spent years reading and researching Japanese society and culture through the limited resources obtained through the Dutch and stories from ship-wrecked sailors, Perry hoped to enter the honor-based society, extending and demanding mutual respect. The Japanese sent envoys to talk with the Americans, but – grasping his knowledge of the Asian culture – Perry refused to personally meet with messengers, waiting to greet direct representatives from the emperor or shogun. The commodore did eventually go ashore in pomp and circumstance, met with governors instructed by the Shogun, and delivered a diplomatic letter; he promised to return the following year for an answer. In February 1854, Perry and the U.S. Fleet returned. They brought presents, including rifles, pistols, a telegraph set and wire, and a small-scale train. The “outer world” technology fascinated the Japanese rulers and people; perhaps foreigners weren’t quite so terrifying, perhaps there was a way to benefit from international connections and maintain the uniqueness of their own culture. Perry left Japan and sailed for the United States, bearing a treaty of friendship between the two nations. It took four more years to sign a trade agreement, and Japan changed leaders. The Shogun died, confusion reigned, and Ii Naosuke became the Great Councilor of Japan. Ii Naosuke observed the trade and drug disasters occurring in neighboring countries who had opened to foreign trade. He believed it would better to sign a trade agreement, adopt Western technology and elements of culture, and filter these influences from a position of strength. Ii Naosuke signed the trade agreement with the United States in 1858 and reached out to five other nations a short time after; several years later Japanese envoys visited America for the first time. Bitter Samurai warriors murdered the Great Councilor in 1860, hating the arriving influences from Western countries. 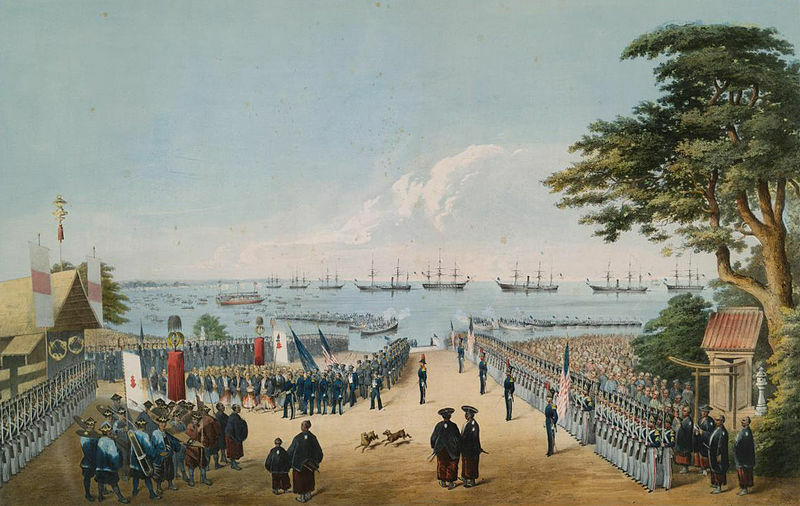 Further revolution in 1869 brought an emperor back to Japan, but the opened ports continued to accept and work with American and other international traders and diplomats. A Japanese account and illustration of Perry’s arrival in Japan. Some historians believe that Perry’s arrival in Japan was merely part of “Manifest Destiny” – a belief that America had been gifted by God to “enlighten” the world. Others point out the military intimidation of his actions. While there is truth in those views, I think it’s also important to consider his actions and his attempts to understand the Japanese society and culture. He arrived in frightful “black ships,” but he reached out with friendship and respect, desiring to help his own country and Japan to establish diplomacy and agreements which would benefit both. 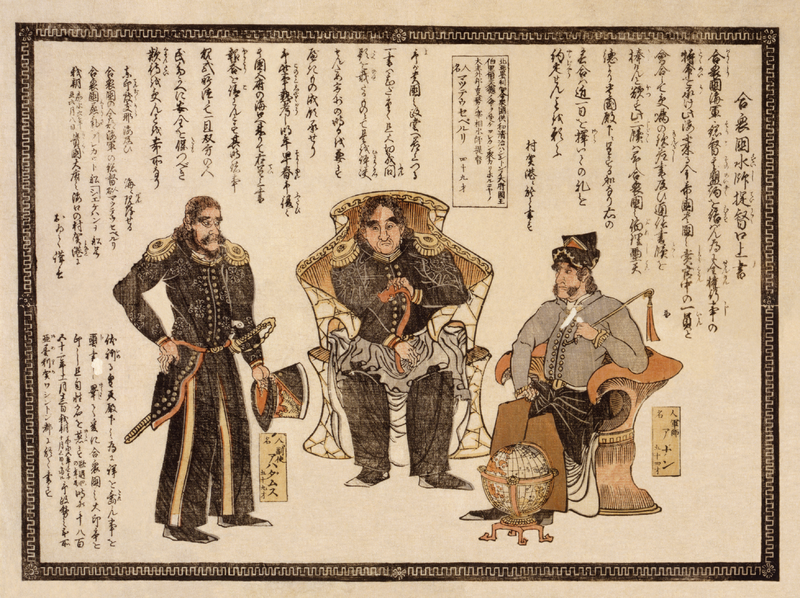 The arrival of Commodore Perry in Japan marked a significant turning point in both U.S. maritime history and the history of Japan. It was a unique and precedent setting moment of strength and respect, offered friendship and mutual benefit. America and other nations would bring new technology to the formerly closed country and they would purchase/trade for the treasures and fine products of the Japan. I particularly like the Japanese artwork. nice find. Thanks. I thought that was pretty cool too.